As announced last December, homebrewer Don Guimond of Grand Bay-Westfield, NB won an online vote with his recipe for a Black IPA with Coconut and Rhubarb. 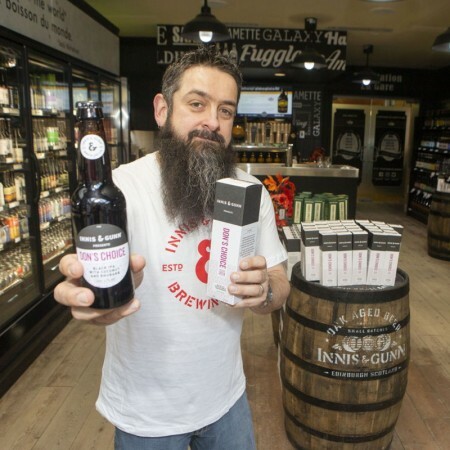 He was flown to Scotland in February to brew his beer along with the Innis & Gunn team, and it spent several months aging in bourbon barrels before being packaged for release. The black IPA was brewed with chocolate and crystal malt, which give it a rich, jet black colour. Flavours of coconut, tropical hops and rhubarb combine with the malts and the barrels for an unforgettable taste experience. Don’s Choice is being released in a limited run of 330 ml gift-boxed bottles with a suggested retail price of $4.95, and is available now in New Brunswick and Alberta, with distribution in Ontario and British Columbia to follow in coming weeks.